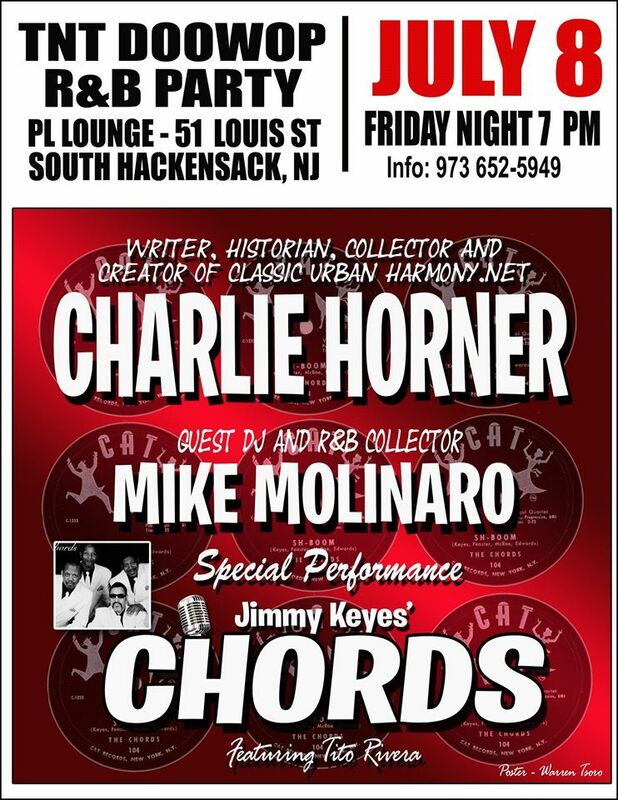 Charlie Horner, Mike Molinaro to spin records at next TNT. Jimmy Keyes’ Chords to sing! Classic Urban Harmony’s Charlie Horner has been invited to spin rare R&B vocal group 45’s at the TNT Doo Wop R&B Party, this July 8. TNT is a monthly get together of R&B vocal harmony record collectors and enthusiasts. It takes place at the PL Lounge, 51 Louis Street in South Hackensack, NJ, Friday night July 8 beginning at 7 PM. Also spinning records will be noted collector and music authority Mike Molinaro. As a special treat, there’ll also be live singing by Jimmy Keyes’ Chords, the group that sang with original Chords’ member Jimmy Keyes before he passed away. The Chords are best known for their cross-over megahit “Sh-Boom”. Should be a lot of fun!